What should a front desk guy do, if he meets a DAM? Yes! Pray for more accounts! 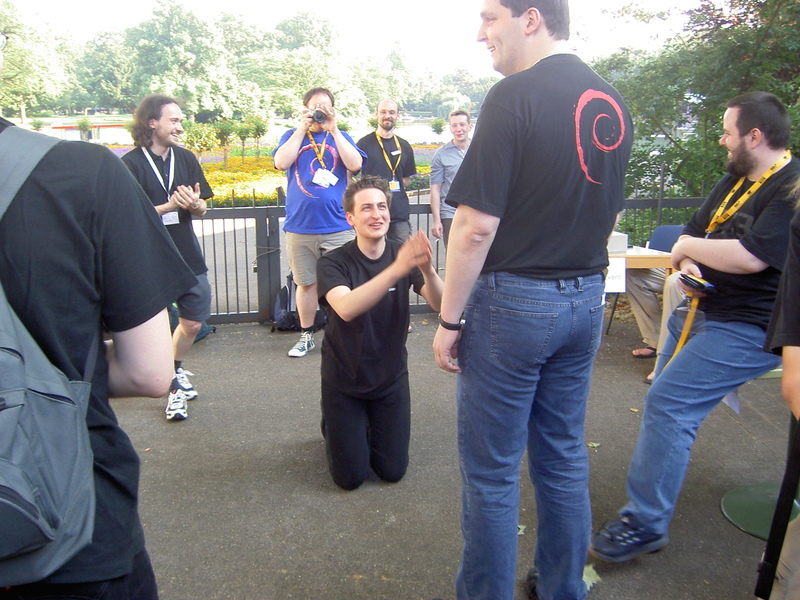 This year we evaluated all talks during Debian-Day at LinuxTag. I just finished to summarize it, and send it to the -events-eu list. If you attended a talk, and would like to add a comment feel free to join the discussion. 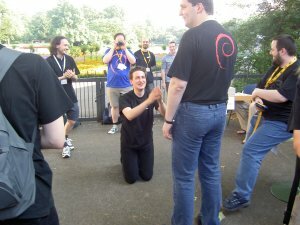 The number of participants for each talk were estimated by Wolfgang Borgert, who volunteered to moderate the whole Debian-Day. Thanks. All in all I'd like to say, we did a good job, with interesting talks and good speakers, although we had small problems when some speakers needed to cancel their talks - special thanks to Enrico and Florian for jumping in and taking over their talks so shortly. Did you know, that you can kick pillars and other hard things several times with your foot (e.g. because you are enraged and need to let off steam) on Saturday, helping to build down an exhibition booth, walking around several Kilometer, travelling home, sleep a bit, stand up on Sunday, do some 30 Kilometer or so jogging, not noticing, that you have sprain toe until Monday, when someone steps on your foot and it hurts you more, than it should more than 36 hours after you kicked the pillar?